Hi Rachel! Thanks for your post. You mentioned the dresser in our bathroom. 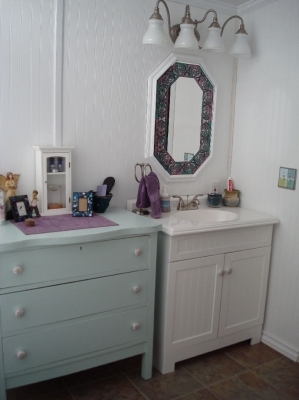 Recently, I've refinished a long French Provincial dresser to use as a vanity with a sink. We will be taking the sink vanity and blue dresser out of the bathroom on this post and replacing them with a longer dresser with a sink on top. I really love the smaller dresser, but the drawers have started to stick over the years and it needs to go. My advice to anyone with a mobile home is the same advice my father has always given me. You can put anything in a mobile home that you would in a stick built home. Don't let anyone tell you otherwise. You will just have to modify to accommodate different sizes. We have never replaced anything in our home with anything from a mobile home parts website or store. We have always used standard replacements for everything we've replaced. We have googled and searched Pinterest and watched videos on Youtube galore….Be patient, be kind to one another while working together, and for goodness sake, if you aren't going to invest in paying someone else to do the work, invest in the tools to do the work yourself and learn how to use them. You can do it!!! Bathroom looks amazing. My husband and I are also renovating our bathrooms. Where did you purchase the bathtub? Totally live that style! Hi Melissa. Thank you for visiting our site and commenting. We purchased our tub at Lowe's. I'm not sure if they sell that model any longer. It has a rope style trim around the top. 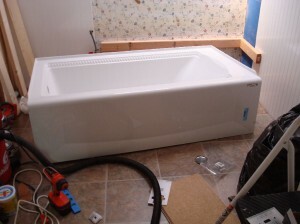 We moved the little wall behind the tub to allow for a traditional sized tub rather than a smaller mobile home bathtub. Hi, I removed garden tub and replaced with walk in shower years ago and it’s great. 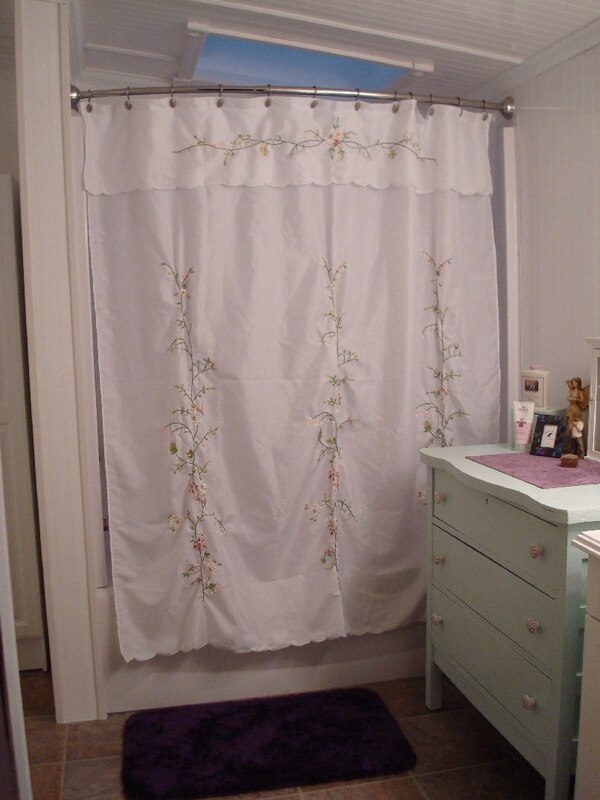 I always wanted to turn the old single shower space into a linen clodet, or pull out shelves but can’t think how to do it. I am single lady so any helpful suggestions appreciated! Thanks so much for visiting. 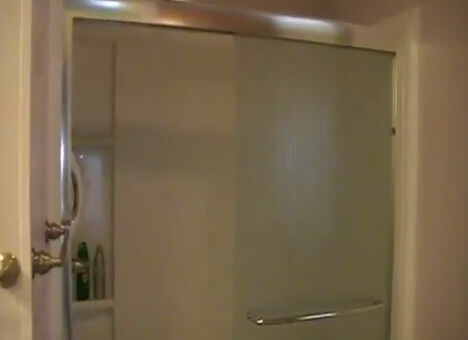 Your closet idea sounds like a terrific use for this former shower space. Shower stalls in mobile homes are usually pretty easy to take out. Most often, it just involves removing some screws or tacks holding the stall in place. 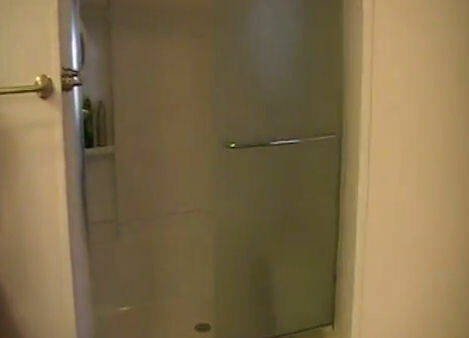 If there is a shower door, this is usually held in place the same way and while they may look like they're impossible to remove, they are pretty easy most times. 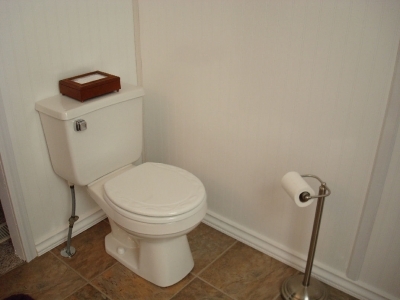 Be sure to detach any plumbing fixtures before removing the enclosure and the shower floor pan. Once the enclosure and floor tray are removed, get a good look at the walls and ceiling and floor in the space. Make decisions about what cosmetic blemishes there are to cover up. Determine if you want to use some sort of wall covering like paneling or bead board or cedar wood (great choices for cedar lined closets at Home Depot!) 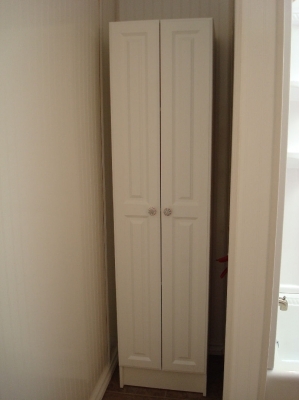 to create a new closet space. An easy 2×4 framing can be used to build a simple wall enclosure to make the closet if the area isn't already enclosed with two sides and a back. If it is already an enclosed space, you may just have to cover the walls and trim it, then put up shelves and maybe install a bi-fold door or a closet door. I hope these ideas are helpful. If you get it done, please come by our facebook page and share some pics at https://www.facebook.com/mobilehomemakeover/. We love to see what folks are doing with their mobile homes! Good luck with the project! I see what you mean about the pipe to the sinks..thanks for that tip, mmhmakeover. After I finish replacing my bedroom door, will start on that project. By the way…my interior door jambs are 3 1/4" wide. Found out that some building supply places (not Lowe's or Home Depot) will actually custom build you a pre-hung door with a jamb of 3 1/4" wide and the price is comparable with the standard house doors you would buy at Lowe's or Home Depot…. Thank you for the info on the doors. As we get older, we keep installing wider doors to accommodate our possible needs as we get older. It's always good to know a good source! Thanks for posting this re-model. I just put some Shaw vinyl plank flooring in a walnut color for my bedroom and painted it, then put in real baseboards and framed two bedroom windows. Used a lot of painter's putty for those windows as there were cracks all over around the window casing. Now I must start on my bathroom by removing that yellow garden tub. I have a question I hope you can answer.. my garden tub is of course bordered by two walls, and there is a lot of space beside the tub sides that are not resting against a wall. There are at least 18 – 24" of space between the tub and each vanity. If the plumbing is mounted at the corner of the tub, right next to the wall, how hard is it to re-route the plumbing, which enters from the floor of the trailer. There is no shower with this tub, and I do not wish to install a shower. The bathrooms in this mobile home are the size of small bedrooms one on each end. Also, if the plumbing comes up through a big hole in the plywood, should the plywood be replaced to accommodate the re-routing of the plumbing, instead of just trying to patch the plywood where the old plumbing enters the floor? I know this is a lot to ask, but I don't want to make a mess. Thanks! We removed a tub like this in a relative's home a couple of years ago. They installed the washer and dryer in this space and asked us to enclose the plumbing that went to the tub in a folding counter that we built for them. We enclosed ran the plumbing over to where the washer and dryer were going to sit and covered it with a 3/4 inch plywood box that we installed a counter top on top of so they would have a space to fold laundry. The hardest part of this task was getting the drain plumbing detached from the tub. We had to saw it off and plug it with a cap in the floor. It's hard for me to envision your particular layout, although you've given a good description. As long as the plumbing to the tub isn't "before" the plumbing for the sinks in the vanity from the water supply, you should be able to cut these lines and cap them securely in the floor Then, you can either fill that plumbing hole in the floor with Great Stuff, then skim it off level with the floor and cover with new flooring, or cover the hole with new plywood if it is too large to fill with Great Stuff. It sounds like you've been busy! I'd be interested to hear how your bathroom task turns out. Good luck! Great transforming and excellent work. A bathroom couldnt get any better than this but can you please tell us what exactly did it cost you ? Thanks for stopping by, Tom. This bathroom remodel cost us less than 2,000$. My husband is worried about the bead board BC its not moister resistant. I love the look however. Have all had any warping? Thanks for posting, Rebecca! The bead board has held up very well. Right over the shower, there are a couple of spots of some very small dimpling, but you can't see it unless you are standing up close. Hard to believe, but we did that remodel in 2007. So, 9 years ago? It's held up nicely. I am considering painting it this Summer. Since it's the glossy finish bead board, I will need to use Glidden Gripper on it first, but I've used that on bead board before and it worked great. I will post about that once I do. This room does get a lot of moisture, but we put a window in the bathroom and also have a great exhaust fan. So, that keeps the moisture down. It is also well trimmed and caulked so no moisture gets under the bead board, which I think helps a lot. The rest of it, aside from the couple of small areas, still looks as good as the day we put it up. There has been no warping or buckling at all. They do make a bead board that is wider slats and is heavier wood-like product. It is available at Lowe's for about 30$ per sheet. We've looked at that for a while, but , feel like it would be harder to work with, heavier, and the edges are inconsistent as far as chips and such so you'd have to weed through a lot of the sheets to find perfect ones to use. Good luck with your projects! We'd love to see pictures when you're through. You can post them at our facebook page! Happy Remodeling! I like your explanation it's very simple and your information display style is amazing, keep it up. I am curious why you continued with the dreaded “strips” if you redid the walls? Why not just put the headboard on all the way across without any spaces? Hi Kathy. Thank you for your question! I used the strips because I liked the cottage look they gave. I didn't really have to use them. I could have used some paint or nail hole filler to smooth the seams in between the bead board sheets but I liked the way this looked. Every other room we have we've removed the strips in. They just worked well for my vision in this particular room. It looks like we have the same bathroom however behind the where the faucets are is covered it seems to be an empty space I took off one board however there is another I want to make s linen closet can you tell me what could be back there? I'm not sure what could be back there. If you want to have access to your faucets, you should leave an open space or a panel on a wall so you can get into that area. 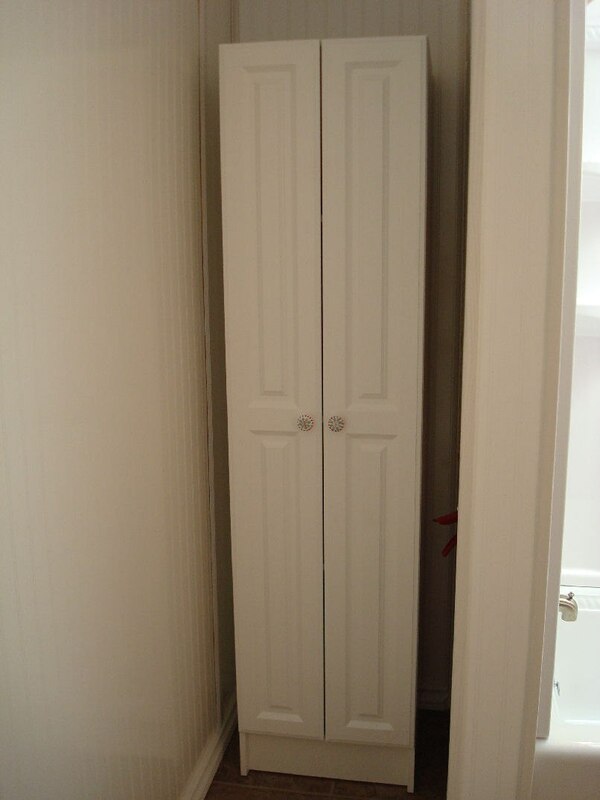 If there is room where you want the linen closet, you can certainly do that, but if one of the walls of the closet will be the wall the faucet access is, you should make sure to put in an access panel or two for the faucet and the showerhead (if the shower is the faucet you are talking about). 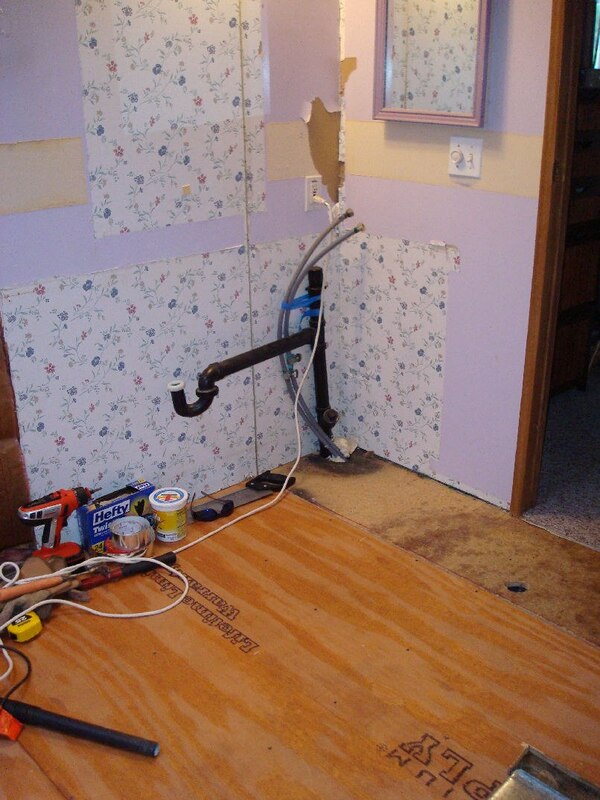 You always want access to any water outlets into your home. 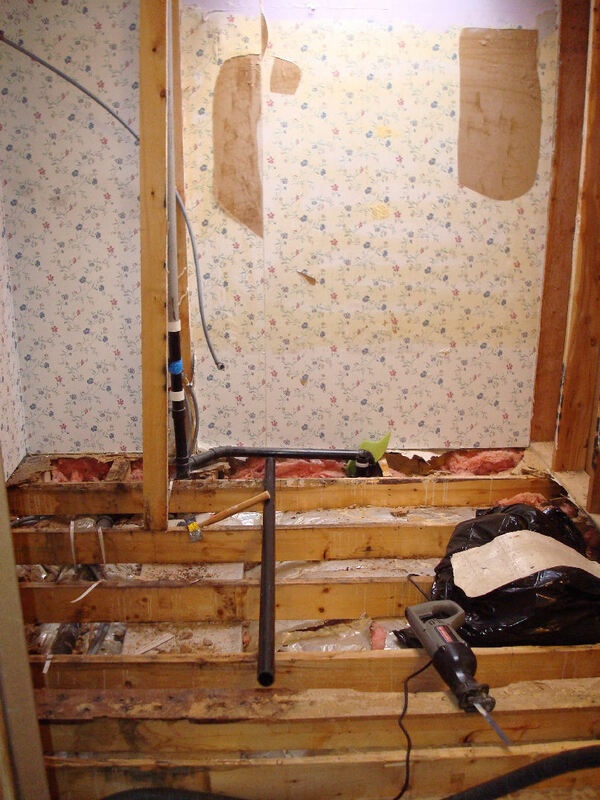 If something breaks, water damage is your worst enemy in a manufactured home…you need access to get them fixed. Good luck with your closet! Thank you for tye inspiration! 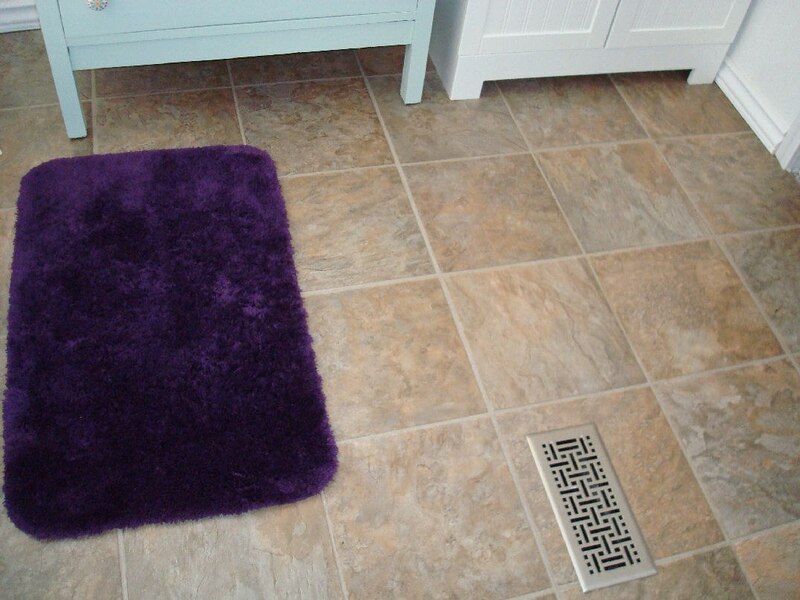 I have ugly carpet in my bathroom too. I love the cottage feel in your bathroom. 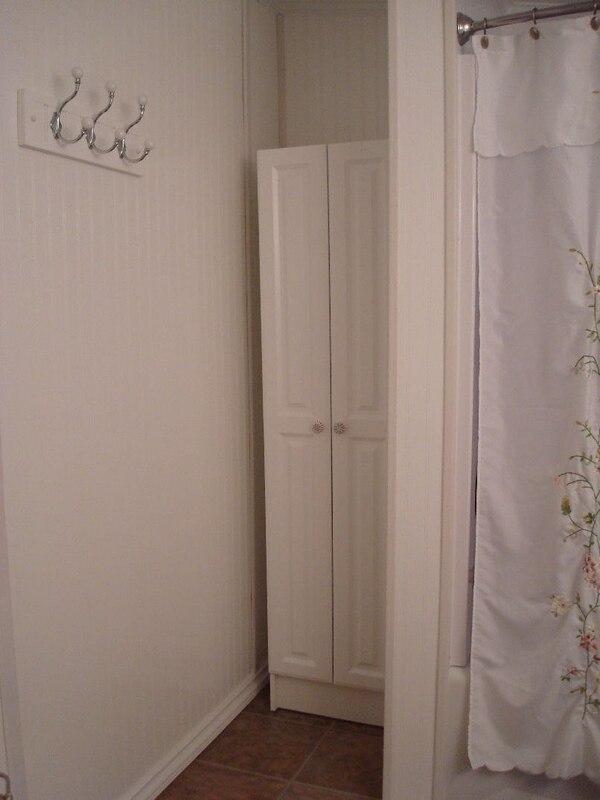 I currently have a garden tub and a stand up shower in my master bath… And no closet or storage space…I was curious if I could close take out the shower put a cut off where the shower was and in close that area to make into a closet? Then replace tub with a tub/stand up shower? Do you think that could be done? I want to go as cheap as possible but yet make it pretty. Thanks for commenting, Gena. Of course, I think you could take out the tub and put a shower and closet in. 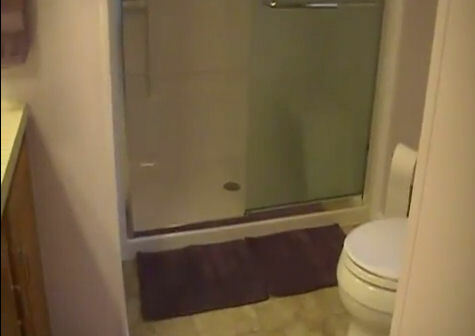 Just be sure you get a large enough shower stall. We used a shower pan that is about 48" wide so we didn't feel like we were in an RV shower! We like a lot of room. But, they make them smaller than that if you don't need that kind of space in your shower and if you want to accommodate for a closet. Putting a closet in would actually make a great masked area for water access for repairs and such. Be sure to include shut off valves with any new plumbing changes you make so you can avoid future water damage in the area and have ease of repair at the source. Would anyone have a solution for windows over a garden tub which we would like to remove (garden tub) and replace with a shower. Hi Kim. Thanks for your comment. That is a tricky question regarding windows in the wall above a tub. Is it possible remove the tub and reposition the new shower so it doesn't interfere with the windows? Like, turn it the other way for instance? 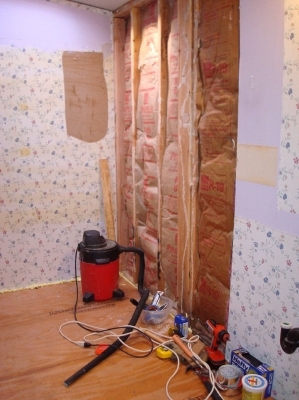 You can take the window out and patch the wall where the window was and put new insulation there, new siding on the outside, and then put the shower in, but that sure seems like a lot of work! If you don't really need the window, but don't wish to remove it, you could cut any sill off flush with the window, remove any opening mechanisms, put insulation in the window area or cover with plywood flush with the wall, then just put your shower stall walls over the top of the window. (This is something I would do :-)) I hope this gives you a few ideas or that you have found solution you will be happy with. Yes, you can. I did. Don't forget to turn your water off before working on it. I did and wow – a geyser erupted and soaked everything, but we got it under control and nothing was damaged! We've had our share of water geysers too. We have installed shut off valves at every water source in our home. It makes it much easier to repair or install fixtures when you can turn the water off at the source. Welcome to our site, Mike. Yes, we covered the existing wall board, but made sure to do the nailing into the studs underneath. This also provided an extra layer of insulation to the room, which has helped make the room feel less drafty. Great job…enjoyed reading about your remodel. 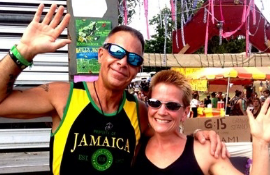 Thanks for visiting our site, Angie! We appreciate it! Thank you for posting all of this wonderful information. I am remodeling our master bathroom. I am ripping out the garden tub and replacing it with a walk in shower. 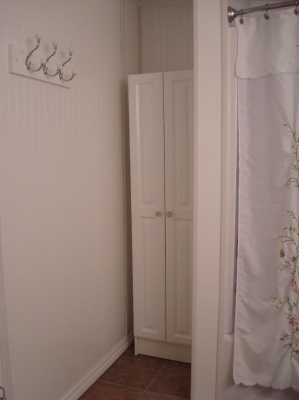 I am going to make the current small shower into a linen closet. That's a great idea! We tore out a bathtub and installed a walk in shower. It's a terrific space and will be much better when we get older and need easier access than a bathtub. Hi cheinsohn, I am sure you are finished with your remodeling by now. My son tore out the shower for me (involved a terrible water shooting everywhere fiasco), but things after that went smoothly. I built a linen closet in the 3' space and never have regretted it. I don't know who designs mobile homes, but whoever does is not in the proper line of work. I am left with a yellowed, nasty looking garden tub (I bet most people don't realize it does not have to ever be used to turn that ghastly yellow). I am getting close to removing that tub and I wonder if you can give me any tips on what you did to get your new tub installed. 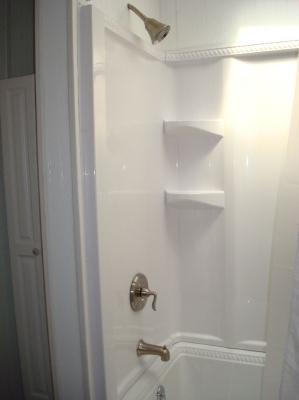 I have a LOT of room at the edges of the tub, enough for a 5' tub, tub-shower, anything. But the plumbing for the current plastic tub is in a corner about 3" from the wall. Did you encounter any problems with the plumbing. Thanks for any tips you can give me. We've not had a problem with plumbing. We just reroute it to wherever we want it to be. The only plumbing we haven't moved is the toilet drain plumbing. We always keep toilets where they originally have been so we don't have to deal with that much work. All other plumbing is easily rerouted. We always use compression fittings because the last a long time and are super easy to install. If there are drains you aren't going to use, you can cut them and cap them off and reroute the drain to the position your new tub requires. 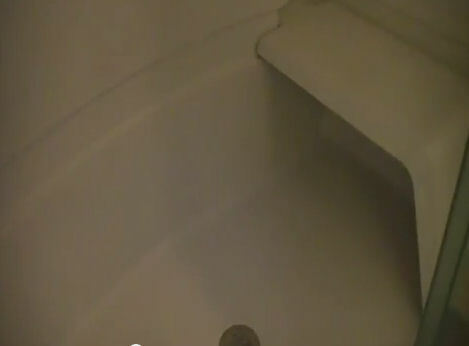 One issue we have found though that might be significant is that it's helpful if the tub drain goes straight down, then has a slight slant downward to it. This allows water to drain more easily without backing up in the tub or shower. Hi Faye. Thanks for visiting and commenting. We always work from the top down, including when we do demolition. Ceiling, walls, floors, then trim. Welcome to the site, Jill! You should be able to get a 54" tub at any big box store. You will likely get a better quality one at one of those stores than you would at a mobile home parts store. 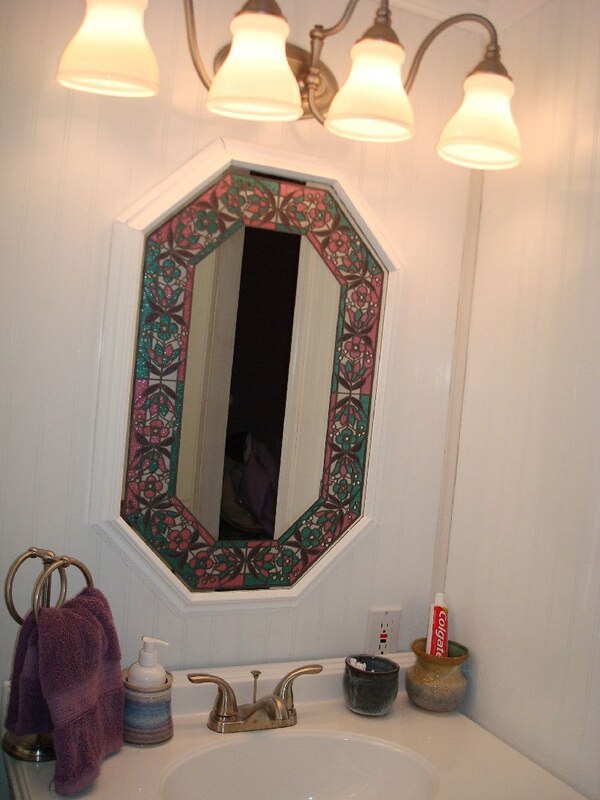 You can pretty much retrofit any stick built house fixtures in a manufactured home so be confident in making changes with that type of materials. Also, any time you are doing bathroom remodels, be sure to install shut off valves at all of your water sources. These can save a lot of money in water damages and their are cheap and easy to install if you use compression fittings. See our post at http://www.mymobilehomemakeover.com/2010/06/we-lo… for more info on our experience with these fittings. As far as tile goes, I have heard mixed messages. Tile should stick fine on walls. However, we have had wall shifting in our home and if you did a lovely tile wall, you might experience shifting at the joints that could make things fall apart. 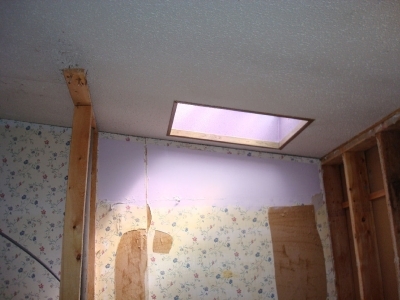 Perhaps if you install sheetrock wall and/or tile backer on top of that, you will have luck in keeping things intact. Good luck with your projects! If you have a chance, please pop over to our facebook page and post some pics. We'd love to see what you're working on! Your bathroom belongs in a magazine. You and your hub did a ‘fantastic’ job. I see people make over rooms in mobile homes all the time, but what I love is that you guys didn’t spend an arm and a leg and still got a fabulous outcome. Just goes to show that you dont HAVE to spend a ton of money to get amazing results. Very inspiring. Thanks Vanessa! We try to do things efficiently and economically. If we didn't, we'd never get them done. You don't have to spend a ton of money to get great results. Especially in a manufactured home. You may not get back your investment if you spend a lot of money on materials and labor. 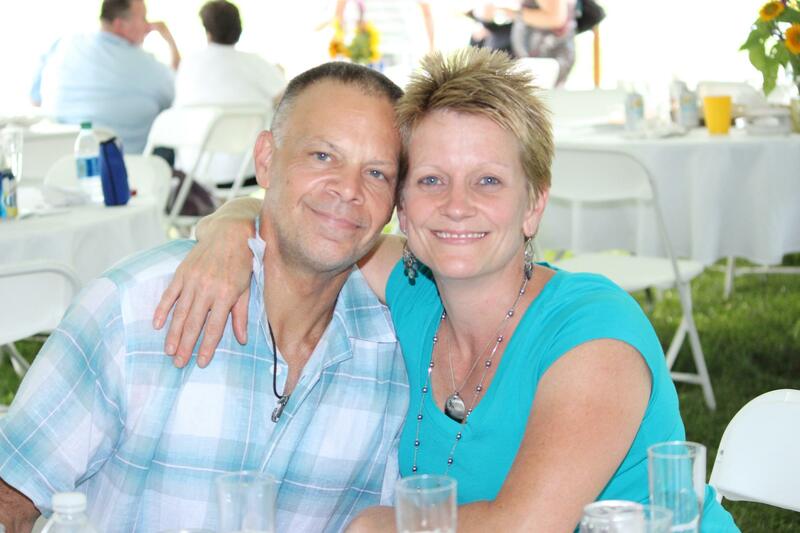 It is hard to sell a manufactured home since financing and insurance doesn't work in our favor often. Best to get a great look for a low price. I'm looking to replace lighting in the bathrooms, however, I am concerned how much can a bathroom vanity light weigh without falling off of the wall? I also have the ugly covered panels, I hate those things. Thanks for visiting, Lynn. 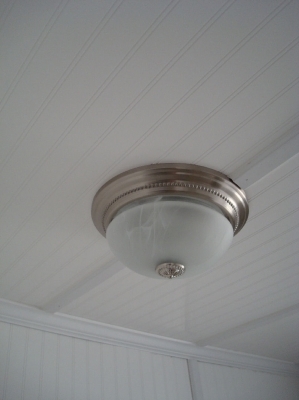 If you fasten a light fixture into a stud, you should be able to support a fairly heavy light fixture. If you are unsure, you can use a method we've used before. 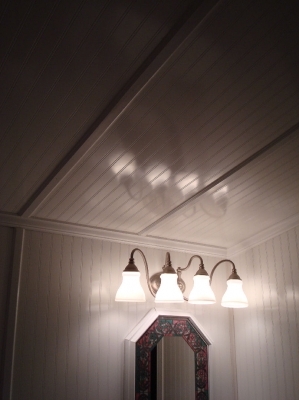 We used a 1"x6" piece of wood and created a wood panel to be a decorative support backing for the light fixture. The area we needed to center the light was right in the middle of two studs so we didn't have anything secure to attach it to. Cut the length of wood that will look nice for your purposes and drill a 1-2 inch hole int the center of the board. Once you've painted it or decorated it however you please, pull the lighting wiring through the hole in the board, then mount the board to the wall by attaching it to one or more studs. You can use construction cement as well as screws for additional security if you wish. For the hole, we use a wide circular drill bit that comes in a door knob drilling kit. I am so glad to have found this website! My hubby rescently discovered that our bathroom sink was leaking. It leaked so much that the floor started to bubble over. So we have to tear out the floor! Since we have to go through all the trouble we (we being the hubby) might as well redo the whole bathroom. His main concern though is the water damage to the under belly of our home. We are not exactly sure how long the sink has been leaking. Would have any advice on how to tackle the underbelly dilemma? 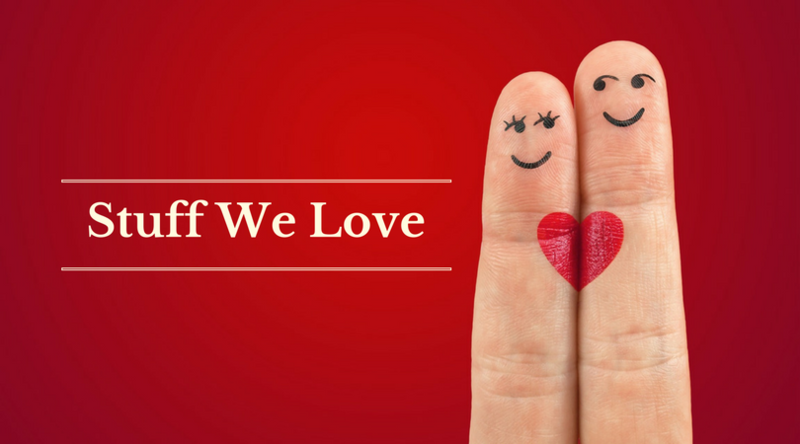 We're happy you've found us too! We had some water issues as well. 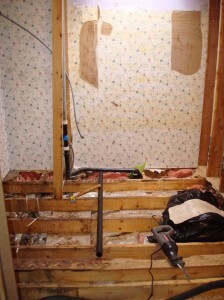 If you tear up the subfloor and find that there are joists in the floor that are rotted from the water, you should be able to shore those up with extra pieces of wood. If they are 2x6s, you can cut a piece that will run from a good portion of the damaged board to another good portion or the end piece that runs perpendicular along the edge of the wall. If you mount this new board along the side of the damaged board and connect it to two good sections, this will solve any rotted joist issues. Secondly, as far as the underbelly, you will be able to see from the inside once the sub floor is up what is going on in the house underbelly. There really isn't much more to it than the subfloor, then the joists, then some insulation, then some black plastic wrap that seals it all in. We have purchased rolls of super fiber tape that is specific to mobile home underbelly repair and weren't that impressed with it. We use Gorilla tape just as successfully. But if you find you want it, check out the link to http://www.ashvillemobilehomes.com/ That's where we got it. Perhaps the insulation is saturated with water and you may want to just take a carpet knife and cut open the plastic wrap directly under the sink to let water out and let the floor dry out for a day or so before putting new flooring down and sealing it back up. If you cut the plastic wrap, be sure to seal it back up with tape. It is often damp under mobile homes so you will want to be sure to use either the black tape I mentioned or Gorilla tape for sure because you don't want critters getting up into your sub flooring more easily. I hope this information helps a bit. Please come back and share your progress and feel free to ask any questions. We will help as we are able. 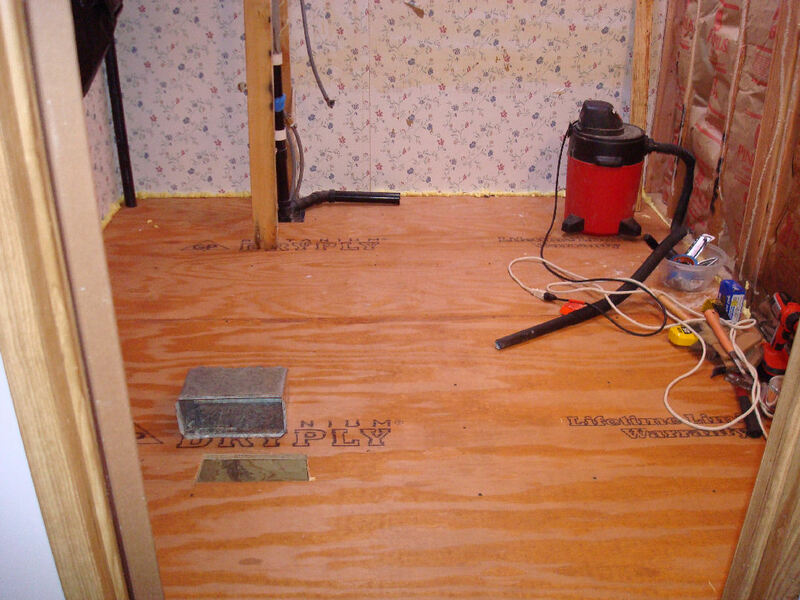 In a mobile home, there’s usually just a 3/4 to 5/8 inch subfloor between your final flooring and floor joists. I recently renovated an MH and there were several rotted spots from floor damage. The best thing you can do is use a jig saw or reciprocating saw to cut out and pry away the rotted spots. Then simply cut a new piece to fit, nail it or screw it down. If your joist is rotted, cut a new piece of 2×8 or 2×6 (depends on what your frame was built with) and splice it to an old joist in the good spots. Not difficult at all. Thanks Vanessa. This is exactly what we did. We used a great plywood product called Drydex. It provided a sealed, waterproof subfloor surface for the bathroom where there's potential for water damage. It's great to share those tips with folks. They really are easy fixes! We use a Rockwell Versa-Cut saw. It is the best tool investment we've ever made aside from a Kreg Jig. You said you used a "Plywood product called Drydex". Did you coat the plywood with Drydex and if so what kind of Drydex product did you use? I have been unable to find any Drydex Plywood. I did however find several types of Drydex products for different types of projects. I am currently redoing a bathroom from the subfloor up and your post was of some interest to me. Thanks for visiting, Paul. 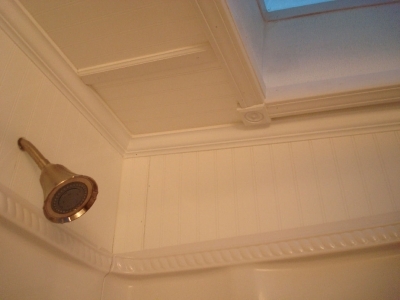 The product was Dryloc or DryPly by Georgia Pacific. We purchased it at Lowes. We didn't coat it with anything, it has a water repellent coating. Hi! I want to take out the hideous corner tub we have and replace it with a walk in shower. My main concern is the floor! Is it strong enough? Should I change the subfloor? I've read in other places that tile is too heavy, so before I do all of the work, I just want to know what I'm getting into!!! If you have any comments, please feel free to add them :) Thanks! Hi Nicky. Thanks so much for visiting our site and taking the time to comment. I apologize for the delay in response. No Excuse…no excuse! When we redid our master bath, we knew we would never do it again. So, we tore out the plain wafer board subfloor and put in a terrific plywood subfloor made of duraply, which was the waterproof plywood they sold at Lowes at the time. To remove the old, we took a sledgehammer to it. And let me tell you, it was the best time I've ever had working on our mobile home :-). Anyhoo, we then put a nice laminate on top of the plywood and then put a large standard size tub and surround in. It has held it fine and I use the bathtub a lot in the Winter for baths. We also removed a hideous garden tub from my mother-in-law's doublewide and put in a beautiful walk in shower. Please forgive the quality, I just grabbed these shots off of a video we did of the whole project we did in her home due to a water heater that burst while she was away on vacation. Nightmare! I do not know if tile is too heavy, but we have a 400 lb pellet stove in our home and a weight machine that is easily 450 lbs. These are both fine in our house and are heavy weights in concentrated areas. I also know many people who have had waterbeds in mobile homes so I don't really understand the reasoning behind saying that tile is too heavy for a mobile home. These things travel for hundreds of miles over the road. They are designed to take a load. But, alas, I am just a lowly DIYer so please don't take my word for it. Keep doing your homework. Good luck to you on your project and please do come back again! 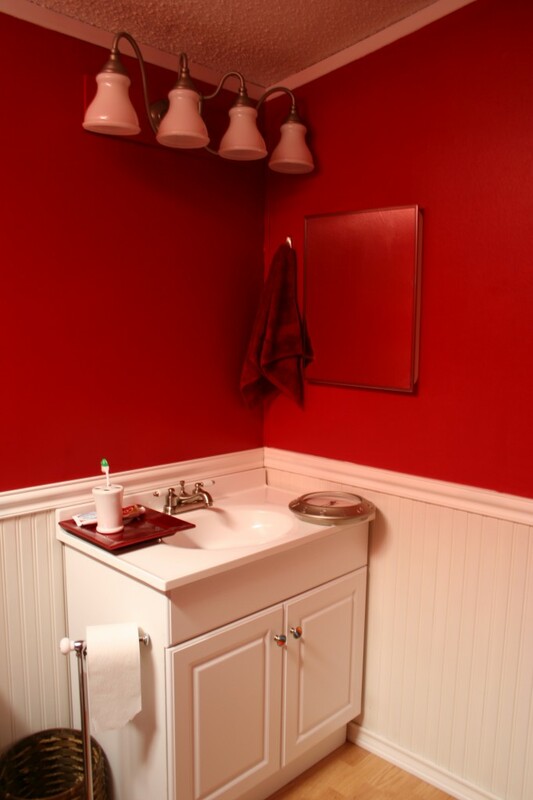 Your bathroom redo looks awesome! The hubster and I are about to tackle our master bathroom. 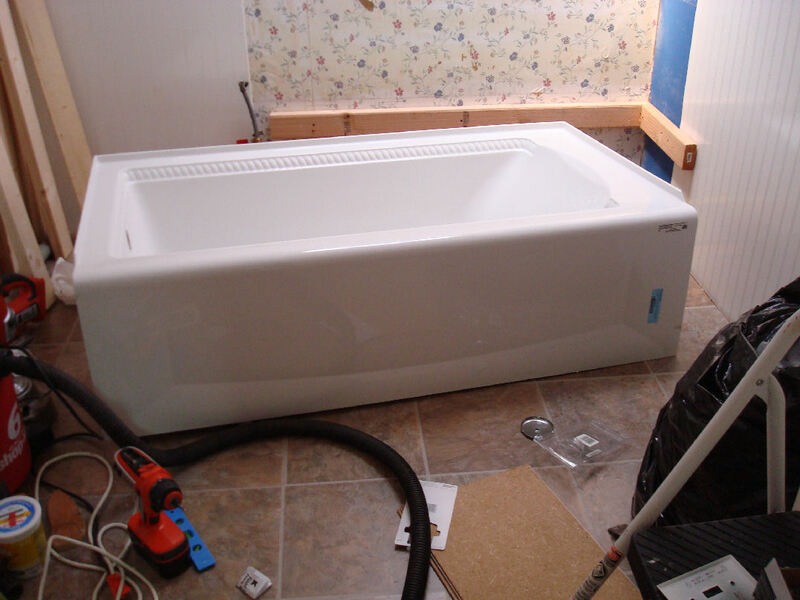 First off we want to replace the ugly, waste of space – yellowed garden tub!! 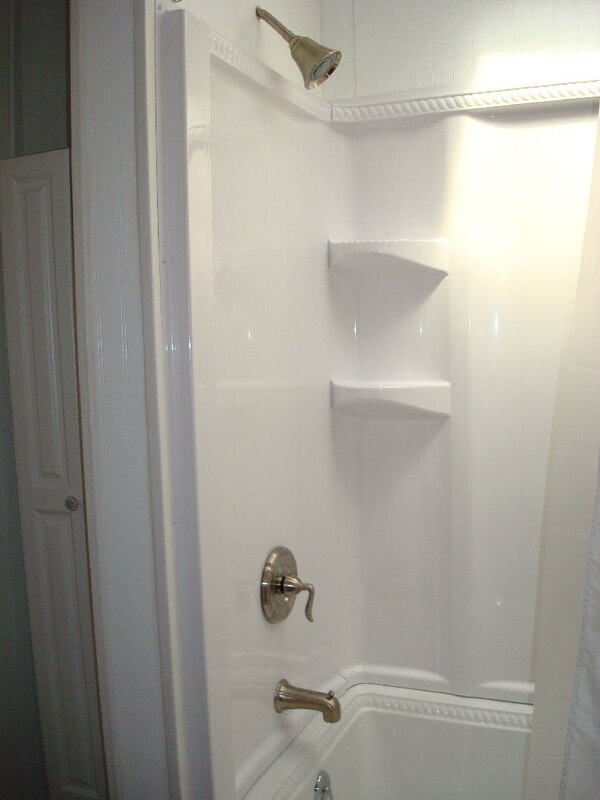 Then would like to put in an access door that will lead from the bath to the laundry area. To save some $ we would like to reconstruct the cabinets under the sink and then replace the double sink with a single to add more counter space. Will be taking some before pics as well as during and of course the finished room! Of course a new floor, wall color and will paint the cabinets and add hardware for a facelift. Hi Tammba10. Thanks so much for the post! I have so much more remodel information and images that I have not posted yet. I do hope you will come back and share your image links for the work you're planning to do. If you run into a snag and wonder if we had the same experience or wonder how we dealt with something regarding mobile home remodeling projects, please feel free to contact me through the site and I'd be happy share any experience that might be helpful to you. Good luck with your projects! This is a great post. We're always looking for smart resources to share with clients and colleagues, and your piece is absolutely worth sharing!